The following text is an initial and incomplete reflection on positional fluidity and the role it will play in the upcoming years. A way of thinking about the game is presented, with 7 players outside and 3 players inside, who get in and get out depending on what the game demands, complementary to the current view. Furthermore, implications on how teams should be trained and players developed derived from this way of thinking are described. In particular, the need to develop the skill to generate types of superiorities (positional, qualitative) other than numerical (which will no longer be sufficient), and to deepen the theory around what a “good pass” means in football. The post is supported by Spain v Germany, a friendly match played in March 2018. 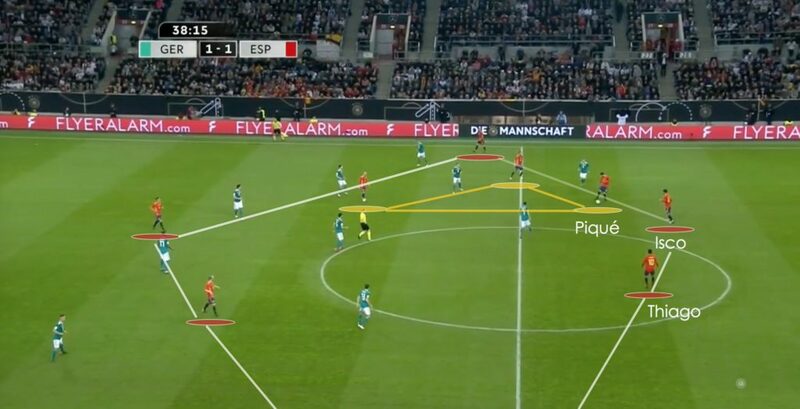 The Spanish National Team represents nowadays the football of the future, and they show on the pitch different movements and patterns which are expected to be seen more often in the next years. Before starting, watch this video. Josep Guardiola changed football forever. Besides his titles, he consolidated a way of thinking the game whose concepts had been explored and used in the past, but never before in such a systematic, consistent way, so well connected with other ideas as well. This generated, for the vast majority, to start seeing the game from a completely different new angle. When I have the ball, my team organizes initially in a 4-3-3 formation due to many different reasons (width, depth, different shapes that are useful and can be achieved more easily, etc; we all know this). My opponent will try to neutralize me, although leaving one extra defender at the back to balance risk (so 4 defenders against 3 forwards). That means necessarily that we will be having one extra player somewhere else. We don´t know exactly where this player will be, but we know he/she will be there. This player is called the free man. Hence, the whole idea is to exploit this advantage all over the pitch until the final third (supported by other football concepts, such as width, depth, third man, etc), and from there players will have freedom to look for the target. The space to look for here “is” the free man, and the team´s mission will be to move the ball intentionally in order to get it to the free man and progress on the pitch. Positional Fluidity means that a player can play well in different spaces and take different roles, with the ultimate objective of harming the opponent. Around this oversimplified story grew, this last decade, a big chunk of the paradigm of the modern game (specially the Juego de Posición), with lots of improvements and new discoveries at the tactical and methodological levels, which led to an overall increase in the quality of the game. But at some point in time everything needs to get recycled and refreshed. Now, we are approaching a point where more complexity is needed to become successful (or more simplicity, depending on how one wants to look at the challenge). We are approaching an Era where the starting point will stop being to assume that we need to find the free man to progress on the field. The starting point is becoming gradually less often to assume that to find the free man suffices to progress on the field. The game now requires to leverage on other resources, in particular to exploit other types of superiorities (positional, qualitative and socio-affective). Key spaces are now being discovered and offset more often, the free man is intentionally chosen by the opponent so that it appears in low-risk areas. The ideal space is not anymore necessarily where the free man is. And with that, more and less conventional movements by players are required to generate the spaces. In particular, the Spain National Team represents the football of the future (or of the past): one with more positional fluidity. Positional Fluidity means that each player is able to play effectively in different spaces and take different roles, with the ultimate goal of harming the opponent by causing confusion. And this space/role that the player is taking is conditional mainly on what the game is demanding at a given moment, and not something predetermined beforehand. Piqué in. 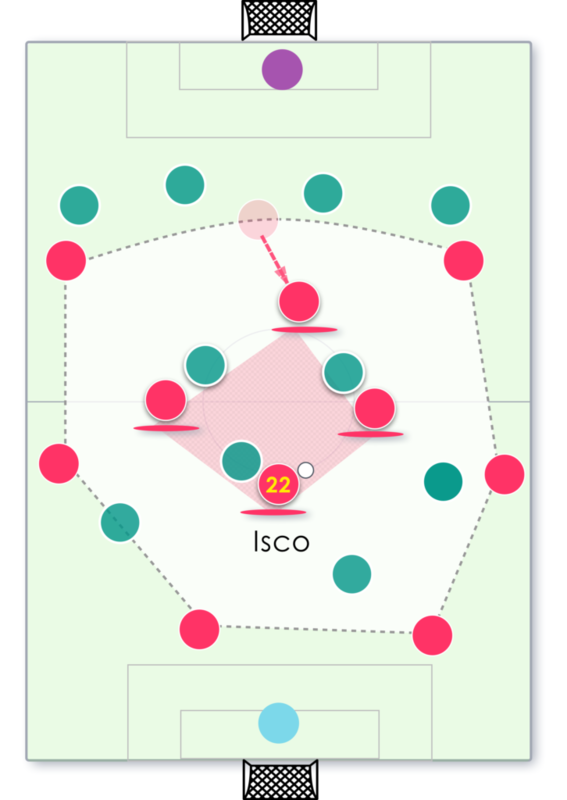 Isco and Thiago get out to balance the Core Structure. It disorganizes the opponent and, well used, allows to find free spaces. The term “position”, being today the starting point to label each player (e.g. “I play as a winger”), is now a function of what the game asks for, based on the defensive structure that the opponent decides to take. For example, nowadays a left winger has predetermined movements for a winger. 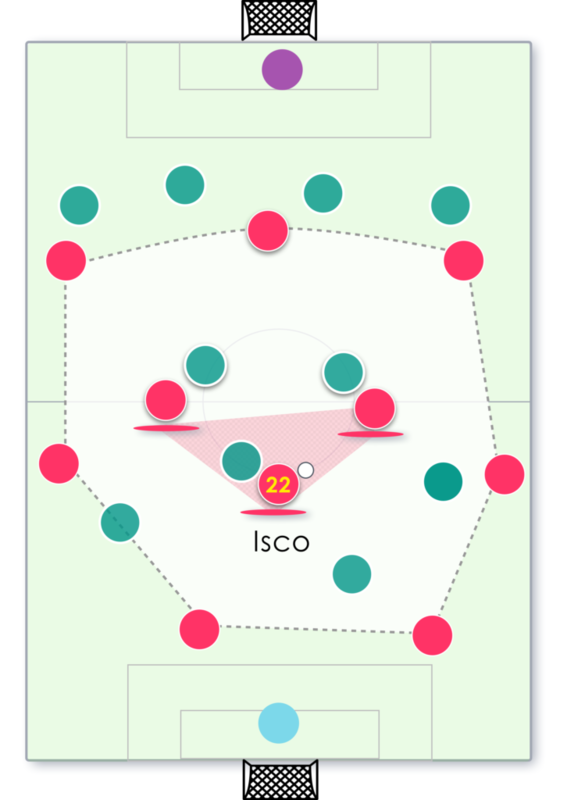 There are some spaces that this player will not occupy because it´s not his position. Taken to the extreme, why can´t a left winger play at some given moment as right back? Why should be continue defining the players by their fixed positions? More positional fluidity allows, in theory, to gain seconds and open up spaces against opponents, who will inevitably have to respond and react sequentially, making it more difficult to keep the reaction speed needed to avoid the attack. Players who get in a zone, get out of the zone and constantly interchange positions can generate disconnection among defenders on how to solve certain situations. The implication is to win necessary time to progress on the field (and not necessarily through numerical superiority). One of the ways in which it looks the game is moving forward towards this is by seeing the situation as one where there are 7 players “outside” and 3 players “inside”. Or 6 outside, 4 inside, depending on whether the “center-forward” moves back to the center. Core structure. 7 outside, 3 inside. Some players get in, some others get out. Players outside continue to provide the necessary width and depth to generate enough space to move the ball. Players inside control the speed at which the team moves forward (in Pep´s terms, they control the game). Depending on where they detect the opportunity is, some get into the center, others get out. Or some get in temporarily to take advantage of superiorities they can detect. At any given moment, each player occupies the closest space based on the Core Structure (rather than a fixed position). Core Structure #2: 6 outside, 4 inside. Exactly the same logic as the 7-3 structure. Why think in these “7 outside – 3 inside” terms? Because a structure will continue to exist. It´s a matter of providing fluidity in order to have an extra option, and not just to generate chaos. Because this Core Structure continues to foster certain desired principles needed to damage opponent (width and depth to generate enough space, etc). Numerical superiority will still be an option (mostly the first option, if possible), but a game where some get in and some others move outside provides with more resources to damage. Impact in Methodology: Positional Superiority. A player will need to know how to play both outside and inside. Tactics set up towards trying to find the free man as the main way to move forward on the field needs to be complemented with bringing more awareness around which way a team can exploit other superiorities (in this case, positional and qualitative) by opening up spaces through more movement of all the players. a) Rondos with no numerical superiority in the center. These two pictures represent two very basic Rondos but with very powerful implications: the first one is a 4v2, where numerical superiority comes by default, and where the idea is to generate the conditions to exploit this superiority. These types of situations (and all the different, more complex variants) have had an enormous contribution in helping players understand something that today sounds very basic: Where the free man is. The second one, on the other hand, has no numerical superiority in the center. It is a 2v2 inside, with joker/neutral players outside, the most simplified version of “some outside, some inside”. Who are inside will need to use other resources to solve the problem. This is what´s happening in elite football. The player needs to be able to solve problems using sprints, protect the ball, dribble. And, of course, lots of movement. In the last decade, it has been more common to find Rondos born from the structure on the left, that implicitly assumes that the solution comes just from finding the free man somewhere. This suggests that it will become more important to put more weight to the second types of Rondos (with no numerical superiority, at least inside), as the type of game played in the center has new demands. b) Increase the level of conversation around passing. The quality of the pass matters a lot. And if it matters a lot, it cannot NOT be in the youth development programs as a core aspect. But I am not talking about the technique of the pass; I´m talking about all the information that can be sent through a pass. In this post (Spanish only for the time being) I suggest that the next move comes implicitly in a pass. Under situations where the game will demand players to beat opponents positionally (and not necessarily in number), a pass is what connects the ideal space with the ideal time. In a pass can come the problem already solved. More than ever, technique and tactical intention should go hand in hand, and to split them is very dangerous. As a consequence, speed, time and direction chosen for a pass should have exactly the same importance at any conversation (for example, a correction or analysis) as the execution has.